I loved every single second of I Am Love. But… why? Because 2010 has been the worst year for movies in the 11 years I’ve been reviewing films? Nope. Because it’s a foreign film? Close, but nope. Because it has a few steamy love scenes? Closer, but still no. Seriously, the reason I liked I Am Love is as simple a reason there is to offer: it’s a damn fine, nearly flawless film. I Am Love was released stateside in June to very little success. It only made it to a handful of theatres; those who saw it, including critics, loved it. But most, including myself, paid it no mind and let it slip out of frame. As the year closes out, I had noticed that the film had made it on several critics’ top 10 lists. Thanks to Netflix on Demand, I was able to catch it last night. When the credits cued, I was stunned and sat motionless for several minutes. I let it sit and stew in my mind. An hour later, I started the movie over again. That’s the only time I’ve done that this year. I Am Love is an Italian film starring an Oscar-winning Brit and several Italian actors you’ve never heard of. It concerns a very wealthy family’s trials and tribulations during the course of a year or so. And, like most films not made in America, it divulges very little exposition about who the characters are and what their motives will soon become. The film forces you to figure everything out for yourself, much like if you came late to a dinner party and didn’t know many of the guests. Because I had no idea what the film was about, and because, yes, figuring the plot elements out is part of the fun, I’m purposefully not going to disclose any further story details. I’m not concerned with whether or not a three sentence plot description (like the awful ones you read on the back of DVD cases, or, yes, on the sleeves of Netflix films) makes you want to see the movie. Instead, you should trust my judgment and spend two hours giving I Am Love your full and upmost attention. How about Tilda Swinton, giving the performance of her already impressive career? In the film, Switnon plays a Russian married to an Italian (she learned both languages for the part), who doesn’t speak a lick of English. That’s about as challenging a linguistic task you can present to an actor, and Swinton nails it. Also, I Am Love is the only film this year (other than Black Swan, of course) that is simply a pleasure to look at and listen to. 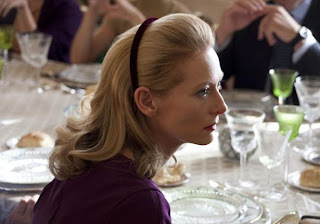 Each scene of the film, as directed masterfully by Luca Guadagnino, is lit with purpose. It isn’t often that you can tell what a character is thinking, based solely on the lighting of a scene. Same goes for the film’s musical score, a compilation of classic works by composer John Adams. Adams’ jaunty-paced strings match perfectly with Guadagnino’s fluid (and at times, anxious) editing narrative. I would watch Tilda Swinton read the yellow pages. Oh hell yeah. Same here.